I’ve been on a Pretty Little Liars telebinge lately and I’m okay with that (though my poor boyfriend may feel otherwise). After every season finale, my internal speculation synapsis begin firing wildly and I convince myself to watch “just one more.” I’m hooked. I want to know who they’re wearing, what kind of cupcakes they buy at Lucky Leon’s and if I can be their BFF (except for Spencer, who I want to smack in the head with a frying pan). But most importantly, I desperately want to solve the mystery: who the hell is A, you guys? I’ve gone down an ‘A’ Rabbit Hole today and after watching some ‘Aria is A’ theory videos on Youtube, I can’t help but agree that she definitely could be. I’ve realized a few things that weren’t in the videos and there was A LOT of evidence listed. 1) The first ‘A’ message to the girls came when Aria arrived home from Iceland. 2) There’s a lot of talk about Aria possibly having a double personality (The Black Swan costume, The Daisy Buchanan costume). It seems to have been overlooked that in season 1 Mike Montgomery has some sort of mental breakdown and his parents disagreed about what should be done about it, ultimately they chose to get him help from a psychiatrist. During this, Aria’s dad is reminded of his brother, whom they infer had some mental problems and killed himself and Ella says something like “Mike is not your brother.” So that means that Aria’s uncle and her brother BOTH have/had mental issues so there is most definitely a history of mental illness in her family. 3) Motive. Yes, Aria could have wanted to keep Ali quiet about her Dad’s affair with Meredith, but what about Ali’s relationship with Ezra? They’ve shown flashbacks of Aria bumping into Ezra when she’s going into her dads office who was a teacher at the college Ezra attended. So what if Aria had seen Ezra around and became obsessed and wanted him to herself? Ali had what she wanted and so she became A to get it and keep Ali away. 4) Aria never really gets screwed over by A. For example in season 2 when Aria and Holden go out together in order to go do things their parents don’t approve of (see Ezra/fight in underground karate matches). ‘A’ sends Byron a letter saying the address of where Aria will be that night (The vegan French restaurant) and Aria (who never misses an opportunity to see Ezra) ditches him to watch Holden’s match. Coincidence? 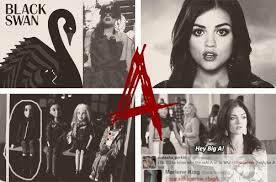 Or Aria trying to make it seem like ‘A’ is trying to mess with her so people won’t suspect that she’s been ‘A’ the whole time. Gahh, okay, I really need to get back to work! Only two more years until we actually find out. If only I could get paid to PLL.